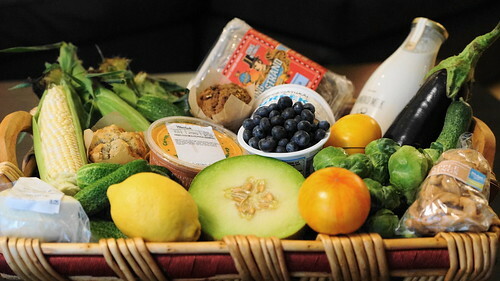 Shopping Basket from the July 23 Mill City Farmers Market - Mill City Farmers Market 2018 - Minneapolis Riverfront Neighborhoods. Lots of new produce in the basket this week: Nistler Farms sweet corn, Brussels sprouts (for the grill! ), melon and eggplant. Picked up a few killer muffins from Sift Gluten Free; and the lemon, Greek yogurt and roasted red pepper hummus from the Wedge Community Co-op Pop-Market will somehow get worked in with the eggplant.